The site of the Aveling Works close to Rochester Bridge and bordering the River Medway now has the modern offices of Medway Council in its place. However, the Aveling & Porter past has not been forgotten, as references to A&P are displayed in the foyer, along with archive material available for inspection by appointment. It is understood the Council still owns an Aveling Traction Engine, although its condition is unknown So it is perhaps right that Maxitrak, based in Staplehurst, some 25 miles or so from the old Aveling & Porter works in Rochester should select this make to base their traction engine and steam lorry on. 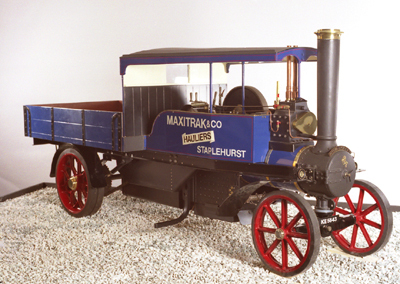 The over type steam lorry was built by most British traction engine manufacturers. Aveling and Porter where no exception building about two hundred lorries in the early part of the 20th century. Our model is based on the 1920's version, making a self contained ride on an engine of considerable power and presence.